After a brief stopover at Vermont, I was on my way to the Niagara Falls through the lush green roads of rural, upstate New York. There were a few things about this stretch of the trip that really excited me. First of all, yes of course, it was the visit to Niagara – which somehow is a hugely popular tourist attraction among Indians (I’ll come to that later). The other thing I was looking forward to was meeting my undergrad buddy, Sabuj after 9 years. He works as a scientist in a chemical gases company in Buffalo (which is only 20-30 minutes from Niagara). A little bit about Sabuj first. We were in the same major (Material Science) during undergrad and Sabuj was my lab partner in most of the electives. Over the course of several experiments we became great friends too, as we investigated various alloys under the microscope, bent steel wires to test their strength, shoved all kinds of things into the furnace and wrote reams and reams of lab reports. This was the perfect setting for two Bengali kids to develop some camaraderie because in the world of corrosive metals, pungent chemicals and evil, bearded lab instructors, you can’t survive without a good, reliable friend. Sabuj infact reminded me a lot of my dad, who is a scientist too. Both are very sincere, highly organized, extra careful, have a great handwriting and always love reminding me of things I usually lack/forget. Sabuj ensured I always carried my bicycle keys, graph papers attached to lab reports and basic stationary. Whereas dad ensures things such as, me carrying my passport and air ticket before my return flight from Delhi to US. (That I’m still forgetful about air tickets etc. is another story.) Sometimes, I joked with my mom that working with Sabuj is almost like being lab partners with dad. Anyway, Sabuj hosted me like a king at his place. We had a great time reminiscing about the old days and also about things that took place since we last met. Then next morning, I was on my way to Niagara. The other thing to note about Niagara is the sheer number of Indian tourists. And like all Desi tourists, there were a good number of folks posing for Patel snaps and also staring and checking out fellow Desi tourists. Also, Niagara is probably close to Sunnyvale, CA in terms of the number of Indian restaurants (claiming to be authentic though) per visitor. Anyway, I was out of Niagara by early evening and on my way to Cleveland. I was looking forward to visiting the Rock and Roll Hall of Fame museum there. 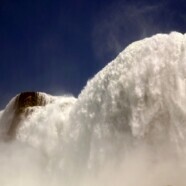 Nice to see you finally at Niagara Falls! Haha.. yes, I heard great things about the Canadian side of Niagara .. Hopefully, will get to visit Toronto and Montreal sometime next year. How do i move the old blog to wordpress and give it a better look. Also have been working on a ghazal post for years now.